We often think the process of hearing God's voice is more complex than it really is. We may be straining to hear God speak in one specific way, when in fact, He is communicating in creative and unique ways which we must learn and discern. As you discover the different speech patterns of God, you can position yourself to hear His voice with fresh, supernatural clarity! Access the supernatural benefits of hearing God's voice. Create an "open-heaven" lifestyle where hearing from Heaven is normal. When we hear God's voice and respond to what He says, we will step into new dimensions of anointing, blessing, and destiny! 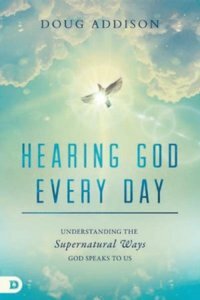 About "Hearing God Every Day: Understanding the Supernatural Ways God Speaks to Us"
Addison is the owner of Doug Addison Web Productions. He specializes in advanced website design, strategic and content management, databases for Web productions, writing and editing for the Web, managing Web project assets and writers, programmers, artists and designers.